17th November 1916. Charles Henderson, MC, Chevalier of the Legion of Honour. E Social, 1900. Captain, 71st Battery, Royal Field Artillery. Killed in action at Martinpuich. From Radley he passed fourth into the Royal Military Academy, Woolwich, and was gazetted to the Royal Field Artillery in 1906. He was killed by a shell which landed on the mess dug out of his battery. At the time of his death he had passed his balloon course, and was an interpreter in French. During his last week’s leave he obtained the Royal Aero Club’s certificate as a pilot. 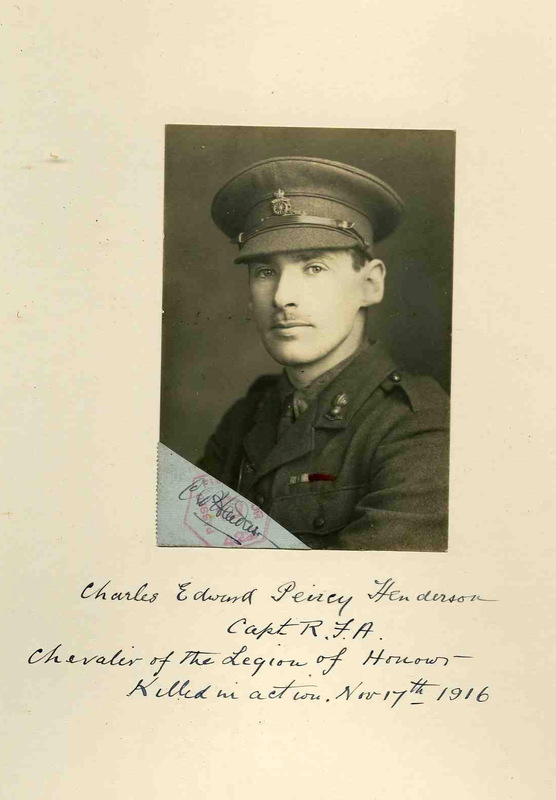 He served in the battles of the Aisne and Marne with the R.F.A., and joined the Royal Horse Artillery during Ypres, 1914. He was present at the battles of La Bassee, Vermelles, Loos, Hulluch, and Hohenzollern, and was awarded the Cross of the Legion of Honour for commanding his battery during the last three battles. His name was sent up three times for the Military Cross. His Brigadier-General wrote: He had a great future in front of him. His ability alone was far above the average, and his energy and power of getting work out of his men were extraordinary. I can honestly say that no officer in France served his King and country with greater zeal, ability, and courage, and I only wish that we all possessed in the same marked degree all those qualities which go to make a first-class soldier. 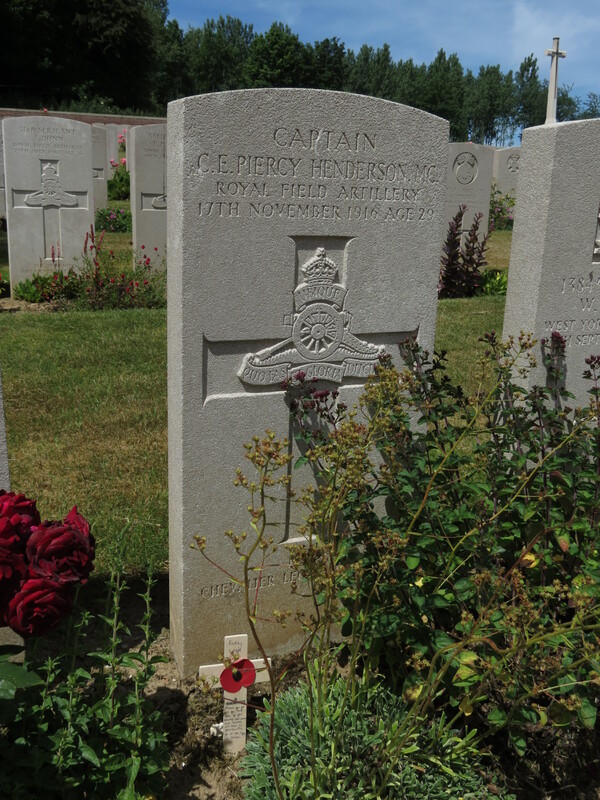 His services up to the time of his death had only been rewarded by the Legion of Honour, and I much regret that such a magnificent soldier had not received further recognition. 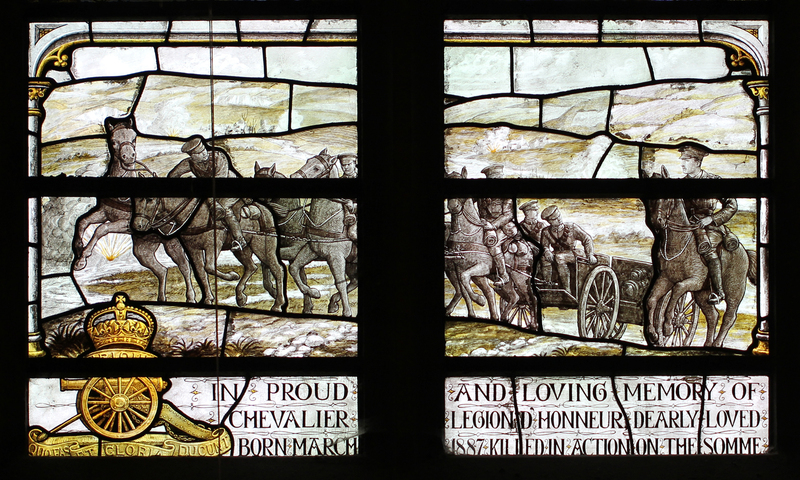 He is commemorated by a stained glass window in Radley College Chapel. The British Archives of Falconry own his hawking diary, started in 1903 when he was a boy at Radley. Posted in Commemorating the Fallen of WW1 and tagged 1st Battle of the Somme, Captain, career serviceman, Chevalier legion d'honneur, E Social, Flanders & France (Western Front), killed in action, Marching in Memory for Combat Stress July 2015, Military Cross, RMA Woolwich, Royal Field Artillery on 17 November, 2016 by archives602.